Gaius Suetonius Tranquillus, better known simply as Suetonius, was born around the year 70 to a family of the equestrian order—a Roman equivalent of knighthood. The exact location of Suetonius’ birth is uncertain, but many point to the ancient city of Hippo Regius, in Algeria, where a memorial inscription in his honor was excavated in what had been once the city square. Although his family was not among the highest elite of Rome, they still had considerable influence. Suetonius claimed that his grandfather had contacts in the inner circle of Caligula (r. 37-41). His father, too, was a prominent figure, serving as a military tribune during the short reign of Emperor Otho (r. 69). Suetonius’ popularity and fame, however, would rise far higher than that of his forefathers, and he would accomplish that feat not with military victories or political maneuverings, but with education and writing. Suetonius is one of the more misunderstood figures among the ancient scholars. His famous work, De Vita Caesarum (On the Life of the Caesars, aka, The Twelve Caesars) gave Suetonius an immortal name, yet it also garnered him an unfortunate reputation of being a lazy gossip. Such accusations become all the more poignant when Suetonius is compared against his equally famous contemporary, Plutarch. Both men were extremely learned biographers whose works are still cherished today. 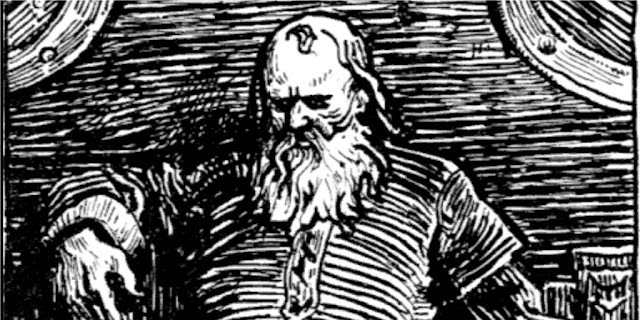 Plutarch, on the one hand, wrote biographies that were seamlessly fused with an overarching historical narrative—he painted the whole picture of the age, not just focusing on the character at the center of his biography. Suetonius, however, took a totally different approach for his own work. In the case of The Twelve Caesars, Suetonius wrote with extreme tunnel vision, strictly ignoring everything that he felt did not pertain to the focus of his biography. His tunnel vision was further amplified by the decision to structure his text by topic (virtues, vices etc. ), instead of chronology. In addition to this, he also had different thematic tastes than his peers. Whereas other writers were interested in war and politics, Suetonius contrastingly was drawn to social events and public opinion. So, while the more orthodox ancient historians would write about the military victories of Julius Caesar, Suetonius would forgo a description of the fighting in order to focus on the lavish celebrations that were thrown after a successful battle, as well as the public opinion of that said spectacle, and what Caesar was wearing at the time. In short, Suetonius cared much less about what a person did than who a person was. The controversy about Suetonius comes from the way he attempted to peer into the personalities of his subjects. In his hunt for information, Suetonius pulled from sources such as oral histories, folklore, lampoons and popular songs as a way to get a glimpse at his subjects’ personal lives. These sources, when separated from historical chronology and filed away into sections based on topic, might give a reader the impression that Suetonius’ work was something of an ancient tabloid. Despite Suetonius’ modern reputation as a gossip, he was actually quite the successful and esteemed intellectual back in his own day. He moved to Rome sometime during the 90s, where he gained the admiration and support of Pliny the Younger. Pliny encouraged Suetonius to publish his writings and also introduced the young intellectual to the elites of Rome, including Emperor Trajan (r. 98-117). With Pliny’s help, Suetonius began rising in the political circles. During the reign of Trajan, or his predecessor, Hadrian (r. 117-138), Suetonius became the so-called imperial secretary of studies and libraries. Later, he was promoted to secretary of imperial correspondence. It is during this time of easy access to the imperial archives and libraries that Suetonius is believed to have written his first biographical collection, On Illustrious Men, and at least the first few sections of The Twelve Caesars. Sometime during Hadrian’s reign, possibly around the year 122, Suetonius was suddenly removed from his post by the emperor because of some sort of impropriety or misconduct. After his removal from office, Suetonius virtually disappeared from the historical record, but he is presumed to have lived into the next decade. 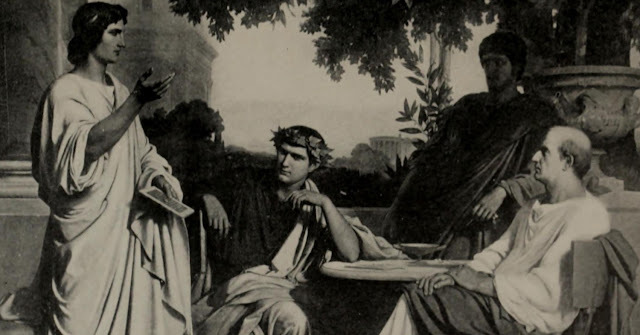 Picture Attribution: (Image of Romans from "The International library of famous literature / selections from the world's great writers, ancient, medieval, and modern," page 552, (1898), [Public Domain] via Creative Commons). The Twelve Caesars by Suetonius, translated by Robert Graves and edited by James B. Rives. New York: Penguin Classics, 2007.